The National Chinese Language and Culture Coalition (NCLCC) is announcing its upcoming National Campaign Slogan Contest! Organized by Chinese Language Association of Secondary-elementary Schools (CLASS), Chinese Schools Association in the United States (CSAUS), National Council of Associations of Chinese Language Schools (NCACLS), and facilitated by the National East Asian Languages Resource Center (NEALRC), the National Chinese Language and Culture Coalition (NCLCC) strives to improve the ability of young Americans to communicate in Chinese language and culture in order to strengthen the competitiveness of the United States and contribute to global harmony. This NCLCC Slogan Contest is open to students of its three national organizations to create Slogans that highlight the multifaceted benefits of learning Chinese in today’s K-12 STEMM curriculum in the United States. In addition to the major 21st Century STEMM projects in the Chinese speaking world, there were countless discoveries and innovations in the field of Science, Technology, Engineer, Mathematics and Medicine throughout thousands of years of Chinese history. Students are encouraged to reflect Chinese specific STEMM discoveries and relate them to the study of STEMM curriculum across the globe and create a slogan that clearly articulates the importance of knowing about the Chinese experience past and present! 1. Each member organization will run its own contest and select the top three slogans from entries as finalists to compete for the NCLCC 2018 National Campaign Slogan at the 2018 ACTFL Convention. e) impact– effectiveness of the slogan. 4. Each member organization plans its own incentives and prizes. Each member organization will complete the selection process by the end of October 2018. The winning Slogans will be announced at the 2018 ACTFL Convention. 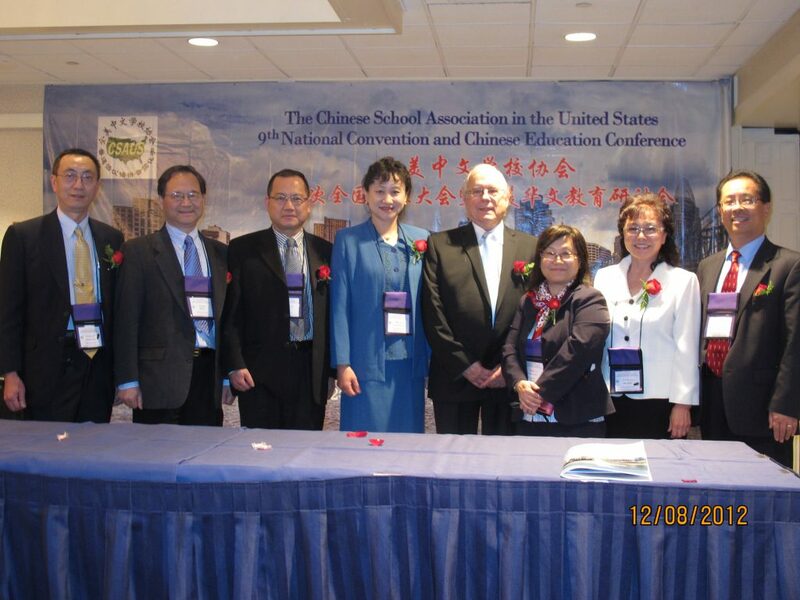 As one permanent member of the NCLCC (National Chinese Language and Culture Coalition), the National Council of Associations of Chinese Language Schools (NCACLS) is pleased to announce its third international conference on Chinese Heritage Education: Cornerstone to US Global Collaboration to highlight the importance of Chinese heritage education in the US for its role in global engagements and collaborations. The conference will feature Chinese language educators and their best practices in the areas of: Global Competence, Curriculum Design, Instructional Strategies, Performance Assessment, Educational Leadership, Educational Research, Professional Development, Technology, and Program Development. At this conference, Chinese language educators will have opportunities to exchange ideas on innovative technologies, obtain the latest research information on pedagogical practices, as well as share resources in the Chinese language teaching community. We cordially invite teachers, researchers, program developers, and administrators in the heritage school community and educators in K-16 settings to submit proposals and attend the conference. 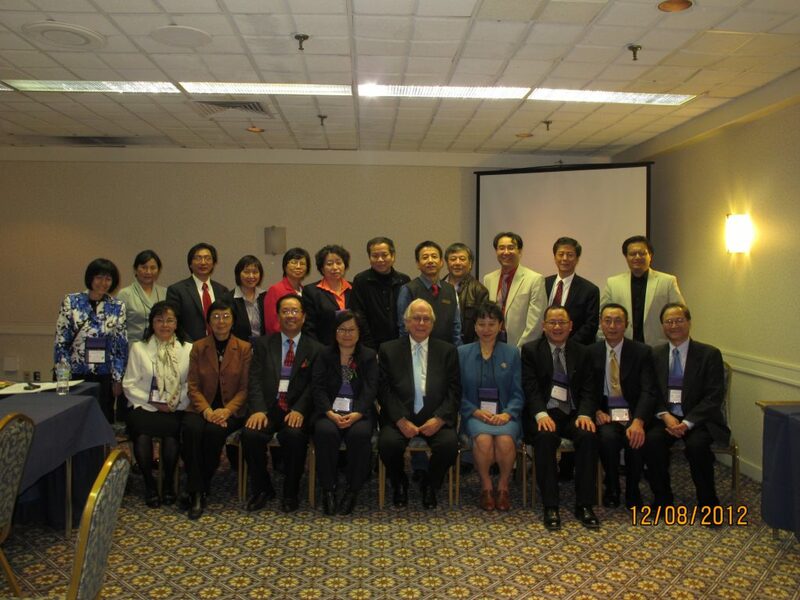 NCACLS has served as a national liaison organization for Chinese heritage schools since 1994. It currently consists of 15 regional Chinese School Associations across the United States, servicing nearly 100,000 students. Our mission at NCACLS is to represent member schools planning and sponsoring events relevant to Chinese language education in the national and international arenas. For the organization’s third international conference, we have invited experts in K-16 Chinese language education to plan and lead the conference program. The Committee is led by Dr. Yu-Lan Lin, former Executive Director of CLASS, with following members: Theresa Chao, Henny Chen, Longhua Hu, Haohsiang Liao, Virginia Shen and Cathy J. Wei. Each presentation is allotted a total of 30 minutes. The presentation lasts for 25 minutes, followed by a 5-minute Q&A. For topics, please refer to the PROPOSAL TOPICS section. Each workshop session is allotted a total of 60 minutes and consists of two or three presenters. The delivery of presentations will last for 45-50 minutes, it will then follow by questions and answers for the remainder of the time. For topics, please refer to the PROPOSAL TOPICS section. Proceedings: Presenters whose proposals are accepted by the Conference Committee are encouraged to submit a 4 to 10 page text with fully developed content by June 30. They will be published online. Details on the submissions will be announced as the time approaches. 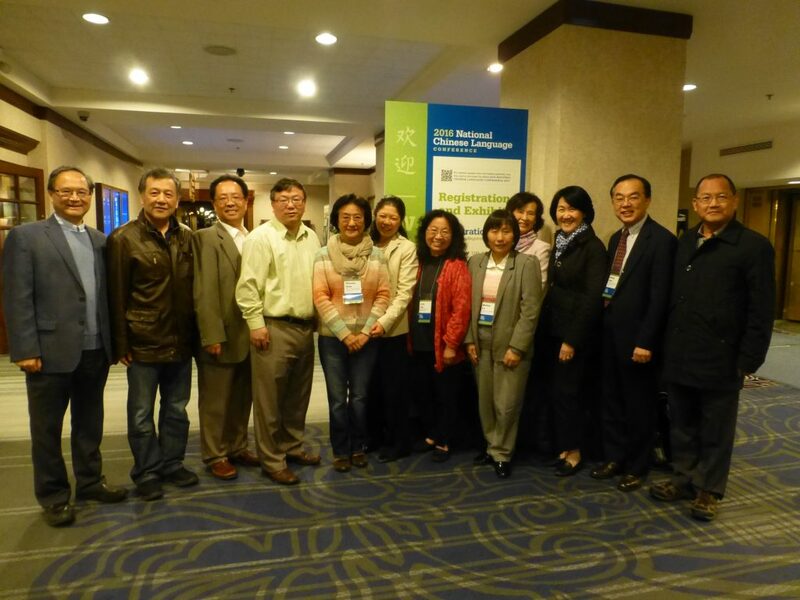 The NCACLS Conference Committee welcomes proposals of the following topics or the topic of your choice bearing relevant application and benefits to Chinese heritage education. Global competence has become one of the core elements to be integrated into a school curriculum. Proposals in this category encompass discussions about essential skill sets and components for the development of global competence. The Conference Committee welcomes recommendations for globalizing the classroom to best prepare students to be linguistically proficient, culturally competent and knowledgeable global citizens, and encourages ideas for exemplary curricular modules, themes, or activities that will develop language and cultural competence across proficiency levels. Proposals in this category may discuss focal issues involving curricular guidelines, development, and benchmarks. Other pertinent subjects for proposals include how Backward Design and thematic units help teachers better achieve instructional goals. Proposals discussing the development of the new literacy skills, 21st Century skills, Common Core of State Standards, AP and IB programs, and any other issues implicating curriculum design are also eligible for review. Proposals in this category focus on instructional principles, methods, and strategies, as well as selection and development of authentic materials for instructional purposes. Other topics for proposals include examples that highlight successful student-centered and differentiated instruction activities. Proposals discussing classroom management skills, student grouping, use of various learner-centered activities, and any other strategies implicating curriculum design and instruction are also eligible for review. Assessment is a powerful tool to strengthen language curricula. Proposals in this category address an array of assessments such as: localized and/or nationwide assessments, World-readiness Standards in relation to assessment, performance-based formative and summative assessments, proficiency and performance guidelines, evidence-driven learning outcomes, self-/peer-assessments, and/or e-portfolios. Assessment proposals also discuss ways to provide feedback for students to improve performance, which allow learners to reflect on their learning progress. Educational leadership plays an important role in Chinese language education. Proposals in this category explore effective ideas on advocacy to improve the prospects for funding, legislation, and policies that define and advance language programs and schools. Suggested topics include examples of effective advocacy, collaborative efforts, and leadership development at the local, state, or national levels in response to policy and articulation changes. Instruction should be guided by research. Proposals in this category inform language educators of research and data-driven findings. They include those practices that engage learners, promote active learning experiences, develop desirable proficiency, and build pedagogically sound programs. Advice on how to successfully translate theory into practices in classrooms is most welcome. Teacher professional development is pivotal to program success. Proposals in this category may include case studies, school/district programs, and qualitative/quantitative analyses that document different professional career paths. Recommended topics are mentoring, coaching, teacher evaluation systems, opportunities and resources for teacher development, and requirements for teaching effectiveness. Proposals in this category exemplify successful experiences that incorporate technological resources and mobile devices to fulfill curricular goals and achieve successful learning outcomes. Discussions of recommendations and challenges when transitioning from face-to-face to blended and online teaching are of great interest. Chinese language programs vary in many ways. Horizontal and vertical programs articulate in heritage and non-heritage school settings remains an area that deserves exploration. Proposals in this category focus on the development, management, and sustainability of quality programs in Chinese schools and other educational settings. Discussions include domestic and study abroad contexts. The Conference Committee will be responsible for reviewing all proposals submitted. The review of the proposals is conducted through a “blind review” process; neither the presenter’s name nor affiliation information is seen during the review process. Reviewers are required to use the NCACLS proposal review rubric to rate each proposal. The final decision will be made by the Conference Committee. Submissions are open to teachers, researchers, program developers, administrators in the heritage school community, K-16 educational settings, and educational organizations. All presenters should adhere to the following proposal guidelines and posted instructions in completing their submission online in a timely manner. The proposal can be written in either English or Chinese (traditional or simplified characters). They are to be submitted in PDF format through the centralized online system; any other forms of submission are not to be accepted. All proposals must be written in the third-person voice, thus, avoiding the use of “ I or We.” NCACLS reserves the right to edit when necessary. Online submission requires the lead presenter to key in background information, requisite information for the proposal, and confirmation of agreement. After completing online submission, the lead presenter will receive an automatically-generated message confirming successful completion of submission. Submitting more than one proposal per person will eliminate the proposals from a full consideration. If you submit a panel session as a lead presenter, you are responsible for adding information for your additional presenter(s) and completing all required information. Only the lead presenter will receive confirmation of a successful online submission; however, both the lead presenter and additional presenters will receive the acceptance/rejection notification via email. All proposals are the property of NCACLS. Any proposal that is thought to be a sales pitch for a commercial product will not be considered for review. The NCACLS Conference Committee is responsible for reviewing proposals through a ‘blind review’ process. Neither the presenter’s name nor his/her affiliation is seen during the review process. Reviewers rate each proposal first, and an average of the combined scores from all reviewers is then generated. The number of proposals that can be accepted for presentation is based on the score rating and meeting space. Submission are reviewed and scored in four areas: Content and Purpose, Organization and Clarity, Quality and Clarity; and Outcomes and Benefits. 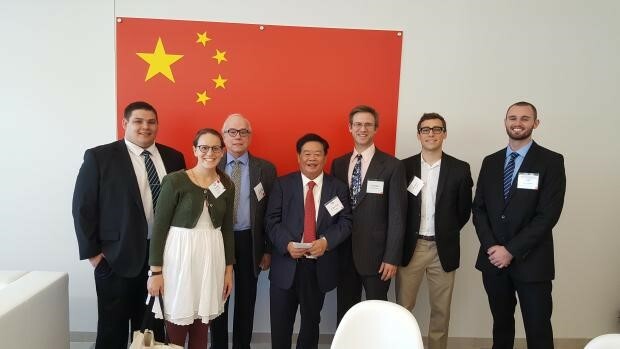 On Friday, October 7th, Professor Galal Walker, Chair of the National Chinese Language and Culture Coalition and Director of Chinese Flagship Program at OSU, attended the grand opening of Fuyao Glass America’s auto glass plant in Moraine, Ohio. Following speeches by Ohio’s Lieutenant Governor, other government and corporate dignitaries, and a representative of the plant’s 2000 workers, Dr. Walker introduced the Chinese Flagship Program at OSU to Chairman Cao Dewang, founder of the Fuyao Group. During their exchange, Dr. Walker extended to Chairman Cao an open invitation to visit the Ohio State University and learn more about the many resources that the university and the Chinese Flagship Program can offer Fuyao. The ceremony culminated years of preparation and planning for Fujian-based Fuyao Group, which also has US operations in Michigan and Illinois. Upon completion, the 116-acre facility, will be the largest glass fabrication plant in the world with the capacity to produce four million automotive car sets and four million automotive replacement glass windshields each year. Currently employing 2,000, Fuyao expects this number to grow to 2,300 – 2,500 by the end of 2017 to meet growing customer demand. The new Moraine facility represents $450 million in total investment by Fuyao, the largest Chinese investment in Ohio history and eighth largest direct foreign investment in the U.S. over the last decade. Bringing auto glass production back to the U.S., Fuyao aims to regenerate both the local Ohio community, with $25 million to $30 million funneled into the economy each month, and the broader automotive industry. 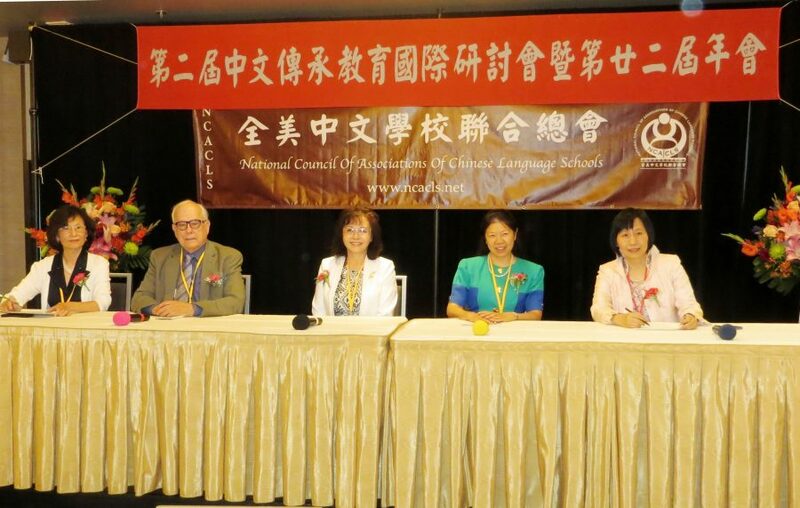 The National Chinese Language and Culture Coalition (NCLCC) held a forum entitled “NCLCC’s Missions and Roles in Chinese Education in America” at the National Council of Associations of Chinese Language Schools annual conference in DC on August 13, 2016. Dr. Yulan Lin, Executive Director of National Chinese Association of Secondary-elementary Schools (CLASS), hosted the forum. Dr. Galal Walker, Director of the National East Asian Languages Resource Center (NEALRC) at the Ohio State University, made a brief introduction of NCLCC organizational history, its mission and visions at the beginning of the forum and a closing remarks at the end of the forum. Dr. Dali Tan of CLASS, introduced CLASS to the audience and her presentation focused on how the NCLCC encourages pipeline programs from K-12 to the highest levels of proficiency and expertise, and develops high quality teacher training. Ms. Mary Shuai, Honorary President of the Chinese School Association in the United States (CSAUS), introduced her organization and discussed on how the NCLCC expands goal-oriented study abroad programs and forms a united voice to realize the NCLCC’s mission. Dr. Wenling Hsieh Lin, President of the National Council of Associations of Chinese Language Schools (NCACLS), introduced her organization and emphasized the importance of using modern technology in research projects, materials development, curriculum design, and assessment, and conveyed the information that the NCLCC is willing to work together with other organizations, companies, government agencies, teachers, and learners to promote Chinese language and culture nationwide. In addition to this forum, the NCLCC is planning another forum at the 2016 ACTFL in Boston. 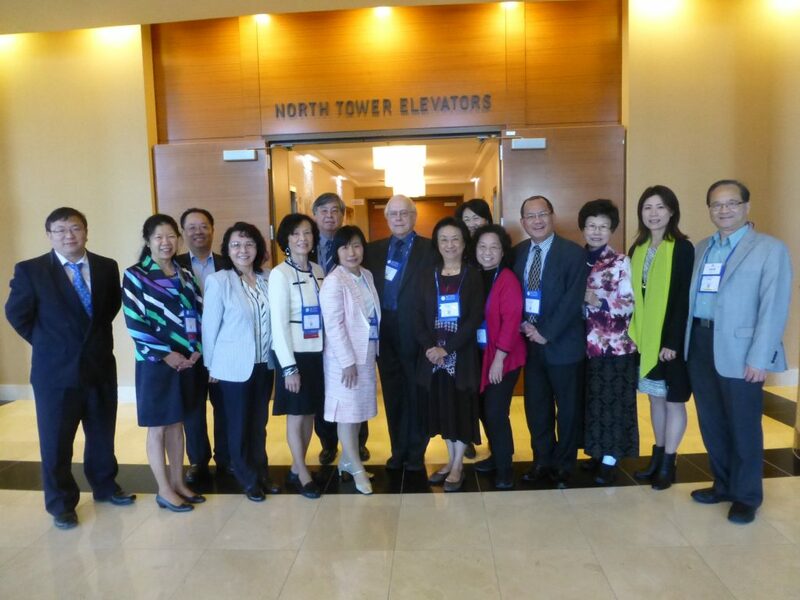 On April 29, 2016, the NCLCC had a meeting in Chicago at the National Chinese Language Conference. At the meeting, the representatives of the three founding organizations nominated Dr. Galal Walker to be Chair of the NCLCC Board, and Dr. Minru Li to be Secretary, with three Vice Chairs each from the three founding organizations. On Saturday morning, November 21, at the 2015 ACTFL in San Diego, the NCLCC held a meeting to discuss the Coalition’s one-year work plan for 2016, hosted by Lorna Xing of CSAUS. At this meeting, they decided to have reps monthly meetings attended by one or two representatives from each organization. On the same day, the participants of NCLCC organized and conducted a forum entitled “Beginning to Dialog with Our Fellow Americans.” This forum was hosted by Dr. Yulan Lin. Dr. Walker presented the introduction and conclusion, and the representatives of the three organizations, Baocai Jia of CLASS, Lorna Xing of CSAUS, and Wenling Lin of NCACLS, discussed the necessity, significance, and benefits for the Americans to include Chinese language and culture in our children’s educations. 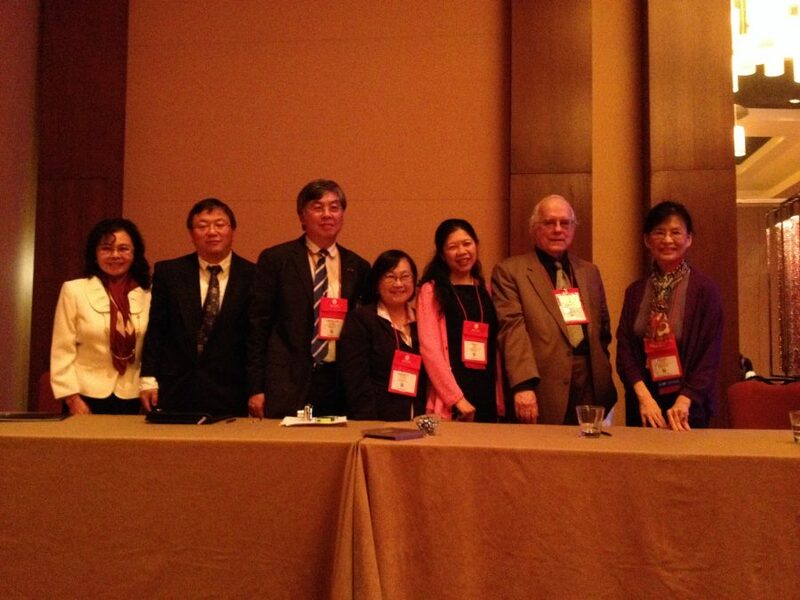 At the CSAUS 10th Conference in Phoenix, 2014, the NCLCC gathered together to discuss the rationale and other issues related to the field of K-12 Chinese education. They also met with Mr. LEI Zhengang, Director of Culture Branch, Overseas Chinese Affairs Office of the State Council, China. 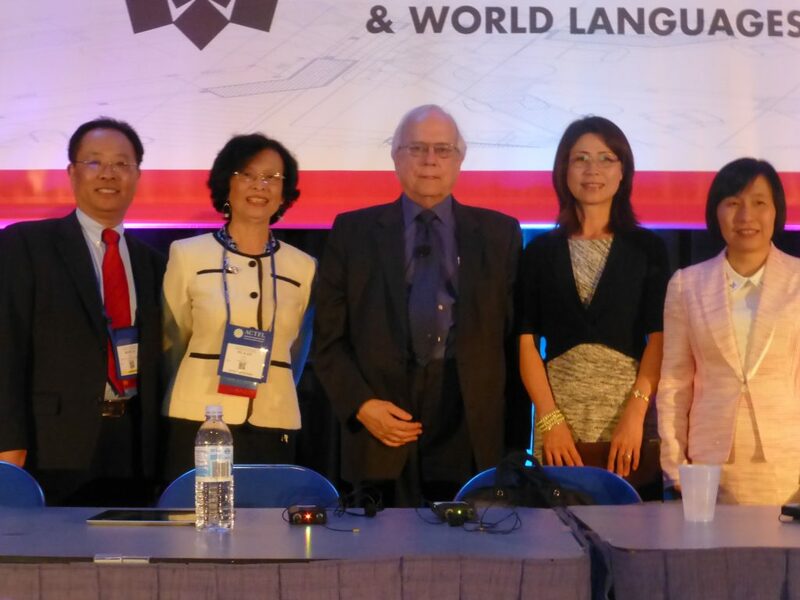 The NCLCC held its first forum at the 2014 ACTFL in San Antonio on November 22, under the title “One United Voice for the Field.” Dr. Yulan Lin hosted the forum. Dali Tan, Yea-Fen Chen, Mark Zhang, and Steve Chang presented why one united voice is needed for the field of Chinese language and culture education in the United States, and Dr. Walker made the introduction and conclusion. On November 22, at the 2013 ACTFL in Orlando, Florida, the representatives of the CLASS, CLTA, CSAUS, and NCACLS, with the NEALRC as facilitator, got together to further discuss the common goals and their objectives. The meeting named this coalition as “National Chinese Language and Culture Coalition (NCLCC)” and drafted the mission statement. On December 8, 2012, the representatives of CLASS, CLTA, CSAUS, and NCACLS gathered at the CSAUS 9th National Convention in Cincinnati. The NEALRC facilitated this meeting. 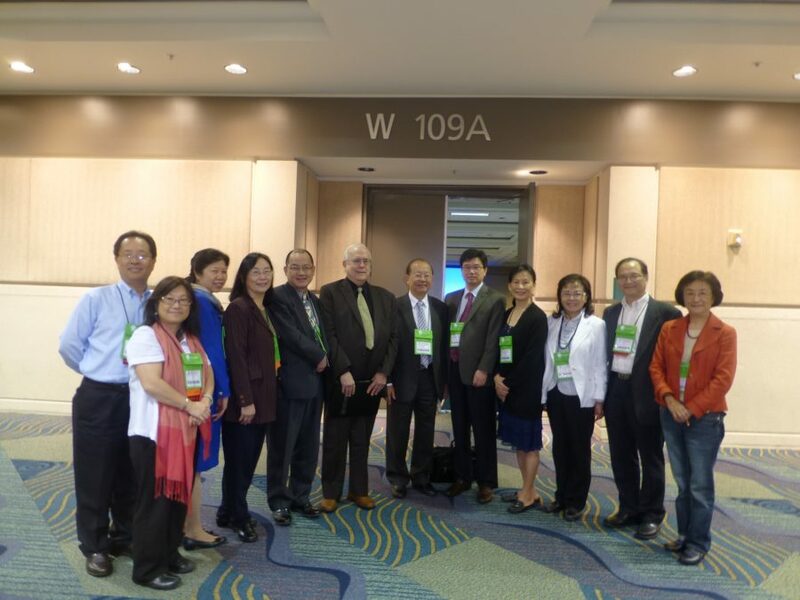 These national organizations, focusing on Chinese language and culture in the field of K-12, initiated to form a national coalition to promote learning and studying of Chinese language and culture in American education and discussed their common goals and mission statement.